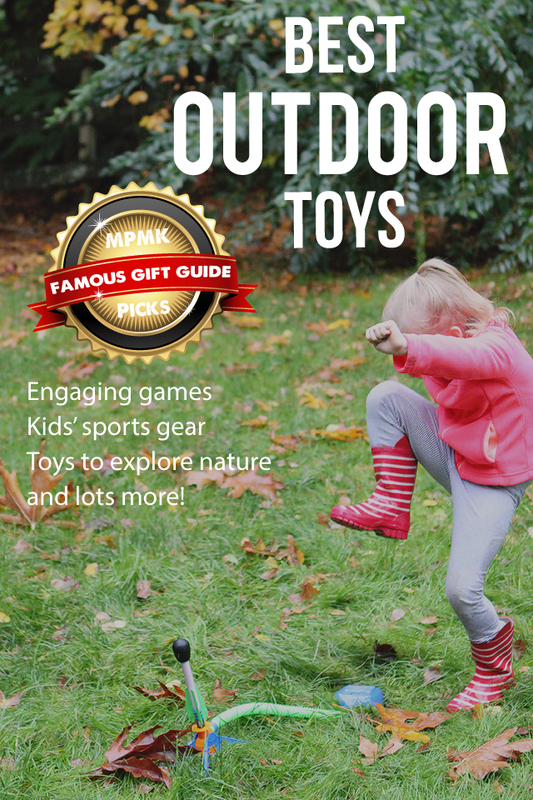 MPMK Gift Guide: Best Toys for Keeping Kids Active Indoors & Out! New! Sign up to be notified when we spot the best sales on these toys or when we decided to give some away! Just click this blue button to get facebook messenger alerts. This guide is a little different than the others in that it’s really two guides in one. The first half addresses the best toys for burning off steam when you’re stuck inside and, let me tell you, these finds can be an absolute life-saver on a rainy day. The second part of this guide is all about getting outside. If your little one has an adventurous spirit, I say run with it! Whether their fascination lies in the stars above, their own backyard, or testing out their own speed and agility, our finds will help you milk their curiosity for all it’s worth. And this stuff will help keep your kids fit too. A pick or two off this list will keep the whole family happy and feeling good all year long. My kids both got to play with this at science camp this summer, during their study of physics, and fell in love. They both, my son especially, get a little hyper in the afternoon and I knew we’d all love having this around for them to stomp to their hearts content in the backyard. Lucky for us, we got one for C’s 6th birthday and I was absolutely right. 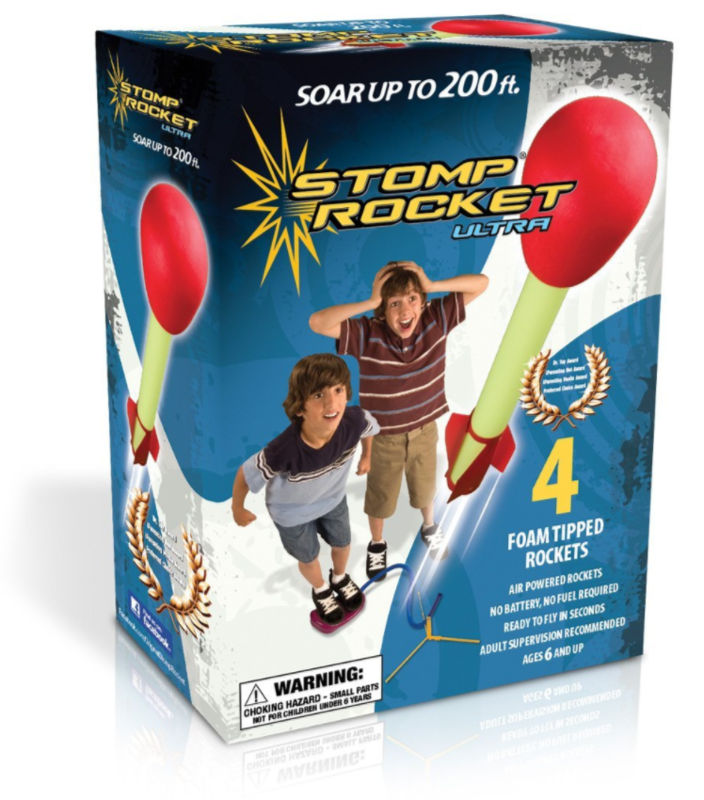 The concept is simple, stomp (or jump) on the launch pad to send a foam tipped rocket up to 200 ft in the air. I like that both sets come with 4 rockets so the kids get to launch multiple times before running around to pick them all up and do it all over again. Obviously the glow-in-the dark aspect of the Jr. Glow Kit is pretty cool. Siblings will love going together, and not having to take turns, and hosting friendly competitions with the Dueling Double Stomp Rocket Kit. In summary, these simple battery-free toys are multi-award winners and get great reviews. Plus they’re cheap – gotta love that! Normally I’m not big on electronic toys with lots of sounds and lights, but when said toy can help my kids get rid of all their pent-up energy inside on a stormy day, it becomes my new best friend. 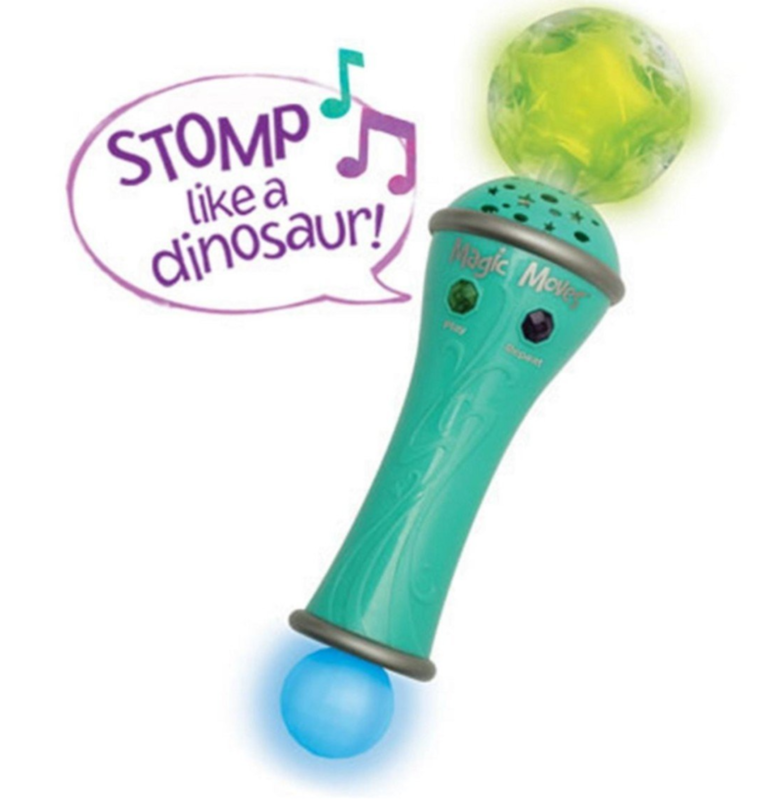 This inexpensive magical wand uses 90 silly commands (sway, creep, stomp like a dinosaur, leap) and 26 songs, along with a light show to get kids moving. This is one of those rare toys that’s great for siblings of different ages to play together (my 7-year-old, 5-year-old, and 18 month old all love it). It will keep the bigger kids interested (who doesn’t like having the mic and being the star of the show?) while developing listening skills in the younger set along with enriching their vocabulary and ability to follow directions. Note: If animals aren’t your kids thing, there’s now also this gym version. This is a beautifully illustrated card set that can be used a myriad of ways. I like how there’s a story element to go along with each of the poses too. The set got such great reviews on Amazon that we bought them for the kids last year and we’ve pulled them out quite often this year when a case of “bouncing-off-the-walls-itis” hits. One of our favorite things to do with the cards is to lay them on the ground in a circle and walk around them with music playing. When the music stops, each child attempts the pose they’ve landed on. There are partner and individual poses on the cards to make it even more interesting. 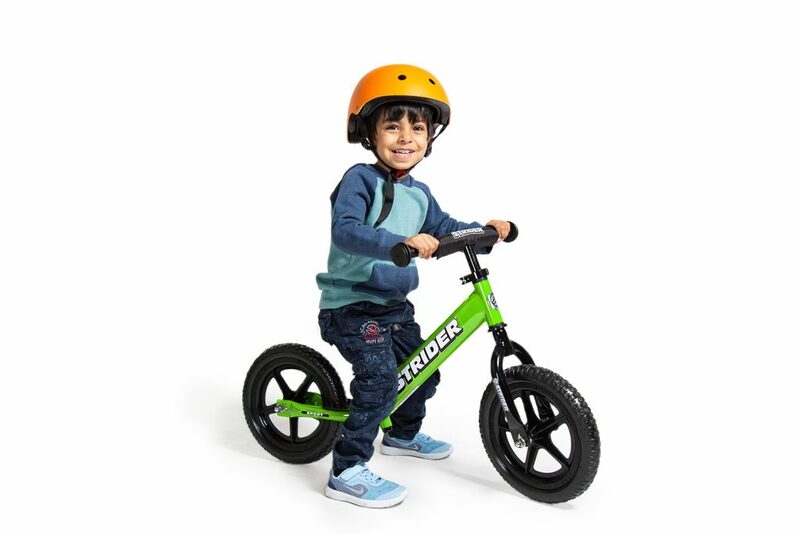 A Strider Balance Bike has been featured in our gift guides since I started writing them 6 years ago, and it will continue to be for as long as I’m writing them. And this year we’re teaming up with them as a sponsor to share my family’s experience. All of my kids have been zooming around on Strider Balance Bikes since they were 2-years-old. When I first discovered them, I told every parent I knew about them. The design makes the whole process of learning to ride a bike so much more natural. 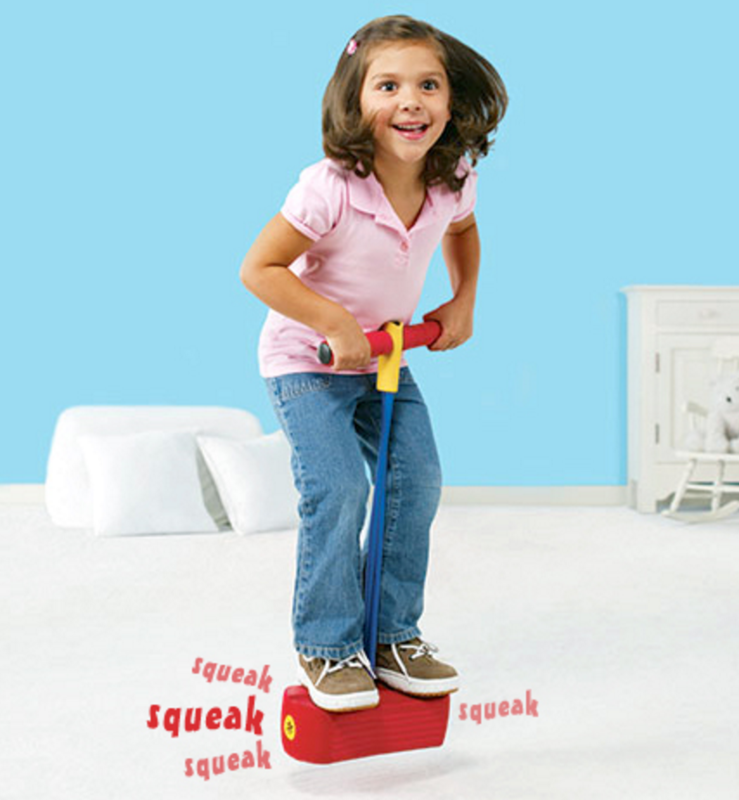 Thanks to the genius idea of taking away the pedals and letting the kids pick up their feet and balance when they’re ready. So the idea here is that kids can push around using their feet on the ground and, pretty soon (really soon if they have older siblings they’re trying to keep up with), they pick up there feet and start zooming along. They learn how to balance on a bike completely naturally and at their own pace. I also really love how lightweight they are. My kids could easily pick theirs up and carry it around as soon as they started using it. Check out this video of some of the cutest bikers ever and you’ll be totally sold. 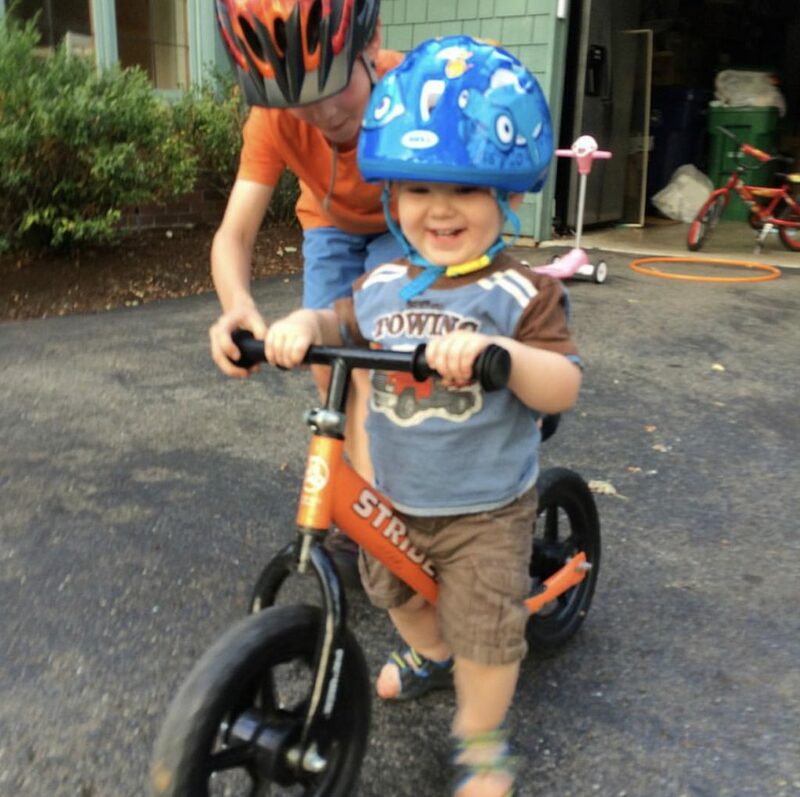 It’s great that the design of the bike allows them to get started so young, but the biggest benefit, of course, comes when kids transition to a normal bike. Balance is by far the hardest part of that process but, with the balance bike, kids already have that down. As a result, it took my kids just a few minutes to figure out how to ride a bike with pedals the first time they tried. If you’re looking for a first bike, I couldn’t recommend this one more! This is a new addition to this list this year (and somewhat of a “doh” moment for me). We’ve had several playhuts throughout the years – some cheap, some expensive but more durable – all extremely successful in keeping my kiddos of varying ages happy and busy. Nevertheless, I still forgot them for this list until I polled my mom friends and they ALL brought up the power of the playhut. Because these guys can be so inexpensive, they’re kind of a no-brainer for me if you have the space. Currently my favorite are this Thomas version, this Beauty Boutique, and this Princess Castle with Glow-in-the-Dark Stars version. Also, I LOVE playhuts with tunnels like this one (more than doubles the fun). In fact, if you don’t have the space to have a play hut set up all the time, I would definitely recommend a tunnel that you can tuck away when not in use. 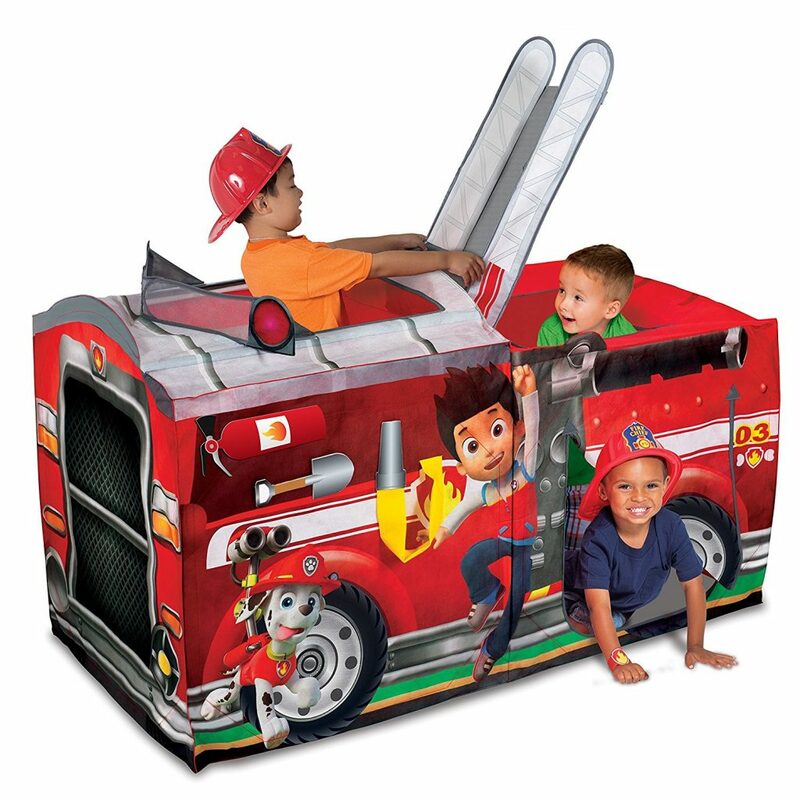 Last but not least, if your toddler is a huge Paw Patrol fan like mine this Paw Patrol Fire Truck Hut with a ladder is going to blow his mind. This one is a big contender for a Santa present this year! I have to start by telling you that I got this idea from Olympic Skier John Mosley. We were doing a sponsored facebook chat together and a parent asked him what he does to keep his kids active. 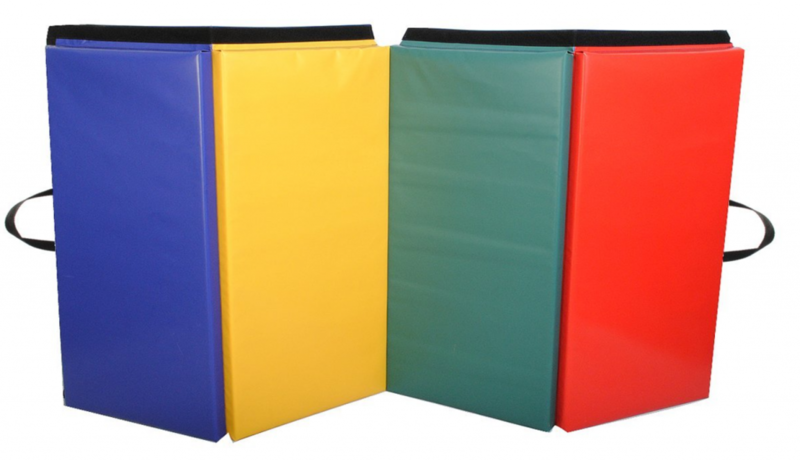 He said that he bought one of these basic gym mats, set it up in his playroom, and let his kids loose on it. So that year I tried it. I bought this simple folding mat for Christmas for my then 3 and 5-year-olds and it was one of the best purchases I ever made. It’s such an awesome way for them to burn off steam inside and they keep finding new ways to use it. At first, it was used for obvious things like yoga and somersaults, but also as a ramp for cars and balls. Then my daughter started gymnastics and started using it for handstands, cartwheels, etc. The kids have also found the can use it to make some really sturdy forts when they add a couple of blankets. One of the things that surprised me most was how much my youngest son loves this mat. Since he started moving, he has absolutely loved crawling, rolling and eventually walking and jumping all over it. When we’re done playing with it, we simply fold it up and slide it into a closet or under a bed. Best thing ever. The key to a good indoor toy is its ability to wear a child out without requiring a lot of space to do so. This soft pogo jumper is an Amazon #1 Best Seller because it does just that. It will keep the kids happy (and get them good and tired) and you won’t have to worry too much about them knocking over your stuff (or each other). We’ve had a broom and dust pan set for years and it’s always been super popular. The kids really enjoy breaking it out to help with clean up when the opportunity arises or just using it to play pretend. Every toddler we know has this set and totally adores it and around 18-months-old our son started completely freaking out if he can’t find it. 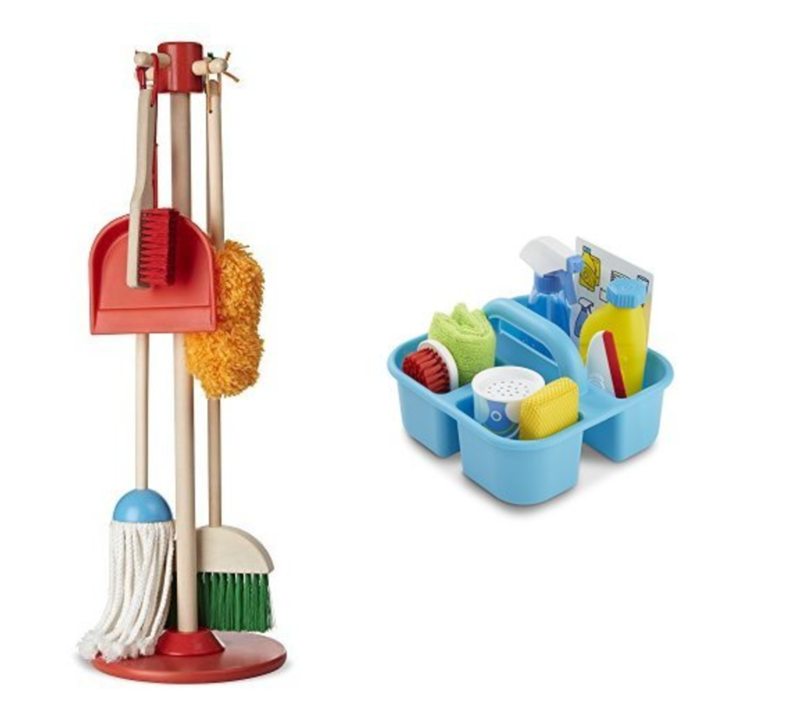 This year, though, I’m thinking of upgrading and totally eyeing this Melissa & Doug Cleaning Bundle- it comes with so much amazing stuff!! Not only will my toddler be able to sweep, mop, and dust to his heart’s content- he will also get to spray, wipe, scrub, and even squeegee. Do you KNOW how much toddlers love, love, love to spray and wipe down windows, cabinets and anything else they can get their hands on? You can also buy just The Dust, Sweep and Mop Set or just The Spray, Squirt, and Squeegee Set at very reasonable prices. Several indoor play centers and community centers around our town have these Step2 rollercoasters and my kids always flipped when they saw them. Easy for younger kids to get on and off on their own, I have seen first hand how they will get on it over and over and over. A friend of mine bought one for her kids a few years ago and said it was an excellent toy in the driveway on sunny days and in the playroom on rainy days. 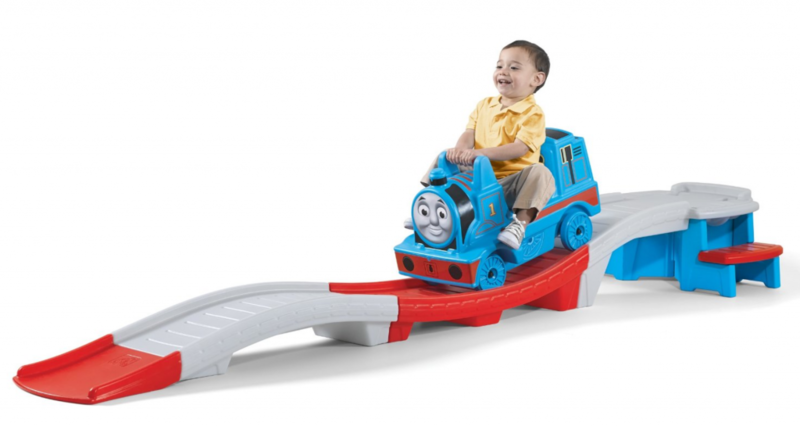 And, of course, the Thomas the Tank Engine version only makes it that much cooler! A few years ago when we had a 20-month-old and a brand new baby, we bought an indoor slide and put it in the upstairs landing between the kids’ bedrooms and it was one of the best things we ever did. 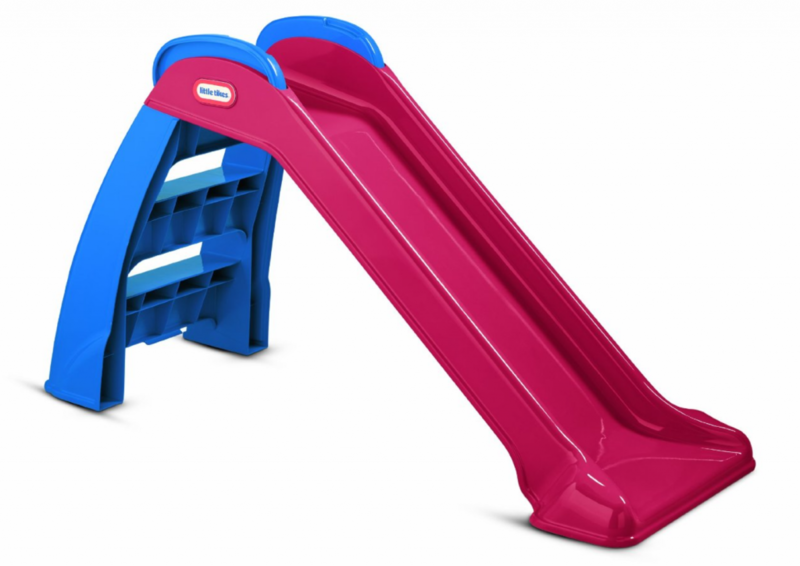 A sturdy plastic slide used inside can be a life-saver when the weather is bad and the kiddos are restless. This particular slide – highly rated for durability and usability for kiddos young and old – also serves double duty outside as an excellent safe place for toddlers to play while their big siblings scale taller play equipment. Every day around 4:30 PM, when things get real, I wonder why we haven’t bought one of these yet. Such a great tool for getting kids’ energy out! Two of my kids’ buddies had one and they each love to jump and jump and jump on it. 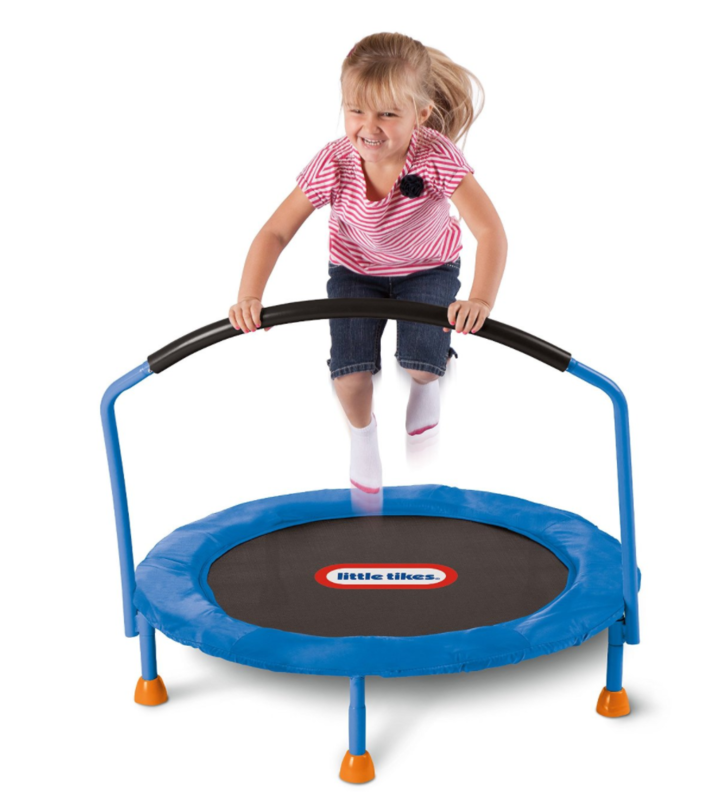 Last year I finally asked my parents to get our toddler an indoor trampoline and recommended this one due to the great reviews… I did not disappoint! It has really been invaluable for getting out pent up energy on cold and rainy days. And now this year it is even better because this version has a handle that folds down!! That means the entire thing can be tucked away WAY more easily. If you’ve been on the fence about one of these, now is the time to finally get one! Check out the stellar reviews on this one and you’ll be sold. It’s a cool space-age car that’s powered solely by wiggling the steering wheel. This multi-award winning toy is one that will be enjoyed by kids of all ages for many years. Enough said. Special Note: In an effort to help you out as much as possible this year, I’ve included both prices and age recommendations for each item. Please take the age ranges as just that – recommendations – you know you’re child best after all! Also, this time of year prices can fluctuate quite dramatically. So if you see something a little outside of your price range, it might not be a bad idea to click over and check it out anyway – you may get lucky and catch a sale. This section was born purely out of necessity. With two rambunctious kiddos bouncing off the walls around here, I’m asking everyone in the family to think about gifting active toys this year! Below is a carefully curated collection of my favorite picks for expelling energy when stuck indoors. Kendama is an extremely addictive wooden skill toy that comes from Japan. It strengthens hand-eye coordination, balance, and reflexes and can (and will!) be played by young and old alike. There are endless trick possibilities for both the beginner and the seasoned master. The Kendama is made up of the “Ken” (handle) and the “Tama” (ball), which is connected by a string. The Kendama tricks are done by variations of juggling the ball in the 3 cups, spiking the ball with the Ken spike, and balancing both in new creative ways. Mastering the Kendama takes practice, focus, patience, and creativity- all great skills for kids to have. The price and size make it a great stocking stuffer too. This is the stripped down version of the above balance board. It appeals to my purist heart (and my disdain for having to listen to noisy toys all day). Plus I think the happy monkey will make kids smile. My kids also got these a few years ago. I came across them at one of my favorite sites for educational toys while looking for balance toys. I like how they can be used to set up different obstacle courses each time they’re brought out and there friends eyes always light up when they see them for the first time. Also, the kids are getting better at them as they get older. They’re also by far the best price I could find – most toys like these are sold to be used in classrooms and are priced as such! This is a very high quality riding toy equipped with multidirectional casters, an easy grip handle, and a comfy 1-inch sponge layer on the seat. It’s also made with non-toxic materials and is PVC free. You can pick from 6 friendly looking animal designs and two sizes (small for ages 18 months – 3 years and medium for ages 3 – 6 years). A good friend of ours has the ladybug and bumble bee and they are regularly played with at play dates by all our kids, ranging in age from 2 to 5. She’s had them for several years now and I can attest that they are built to last. We have a family membership to our local kids museum and hit it up on a regular basis. Every time we do, our daughter beelines for Rody. This is another excellent toy for burning energy and kids often like to use him for elaborate dramatic play scenarios as well. Best of all, his durability is legendary. My sister got these for the kids a few years ago, per my request. 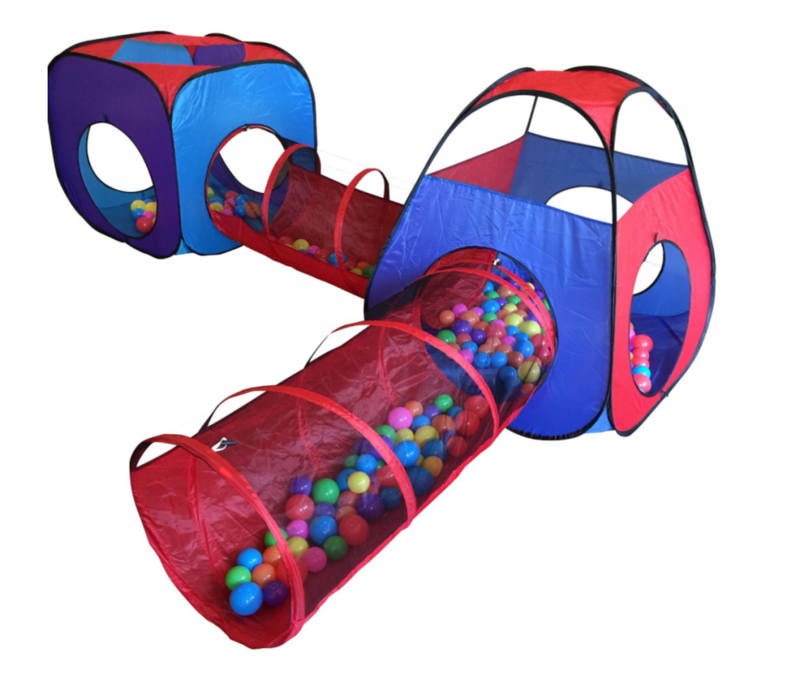 The bouncy ride-on balls have been a fantastic way for the kids to get some energy out when stuck inside. (So much better then running around the living room and kitchen until someone inevitably gets hurt.) We got a 15″ version for then 2-year-old S and an 18″ ball for then 4-year-old C (both of whom are tall for their age) and they are both still using them a year later. I don’t usually provide two options for one slot but I think which one you buy here depends on your wants. Both of these interactive musical mats have the advantage of being engaging, getting your kids moving, and folding and storing away easily and both are highly rated by reviewers. The LeapFrog Learn & Grove Musical Mat has the added benefit of teaching numbers 1 – 10, musical instruments, and animals. Reviewers have noted, though, that some kids get frustrated that the voice doesn’t allow enough time for them to find these things and that the center of the circle needs to be pushed directly for it to work. Still, lots of families still report they love the toy for it’s educational value for the younger set. Not all active pursuits have to be high energy. 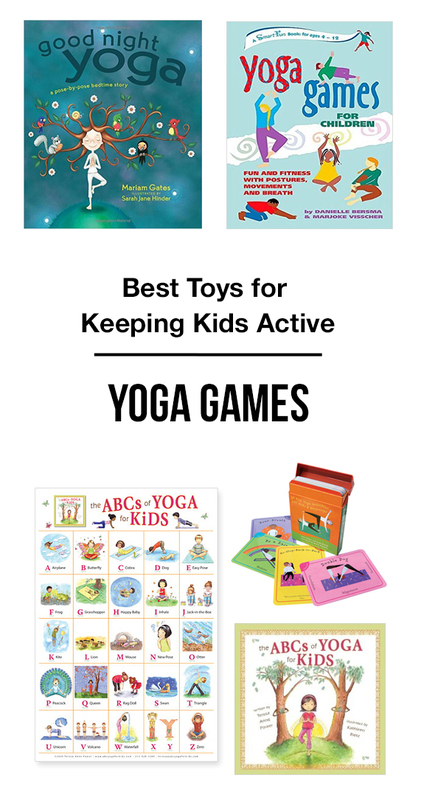 Yoga is a fantastic way to get kids of all ages moving indoors. We started making it a part of our routine after I read a Wall Street Journal article which reported findings that yoga improved students’ behavior, physical health and academic performance, as well as attitudes toward themselves and also that it reduces feelings of helplessness and aggression and, in the long term, helps emotional balance. The benefits of yoga are particularly strong among children with special needs. I’ve seen this one recommended several places. I’m extremely tempted by the lovely illustrations. Along with the original book $16.95, there’s also a coloring book $5.95, a learning card set $17.05, a poster $9.08, and even a spanish version now available. It’s definitely worth mentioning that along with the all the other wonderful benefits of kids’ yoga, it’s also fantastic for getting them to settle down before bed! This beautifully illustrated book is perfect for that purpose. From the publisher: This bedtime story is so much more than a story. It’s a practice for kids and parents to end the day in a calming, mindful way. Turn the page and stretch like a tree, settle softly like a ladybug, float like a cloud, and you’ll be dreaming soon… And for the youngest yogi in your house, be sure to also check out Sleepy Little Yoga: A Toddler’s Sleep Book of Yoga. The stellar reviews for this book really do say it best. One of my favorites: “I work with children. I am a paraprofessional in a special needs school, and was very excited to read this book… One of the things that I noticed right away is how many of the games and exercises were done in groups or pairs. This is fantastic in my opinion! It seems to me that these days kids are more isolated than in the past. So, I was very pleased to find that there were things that there were games where the kids held hands or leaned back against each other. I believe this helps to build co-operation and understanding. There are also plenty of games where it is individuals alone. My favorite is Sun Salutations! 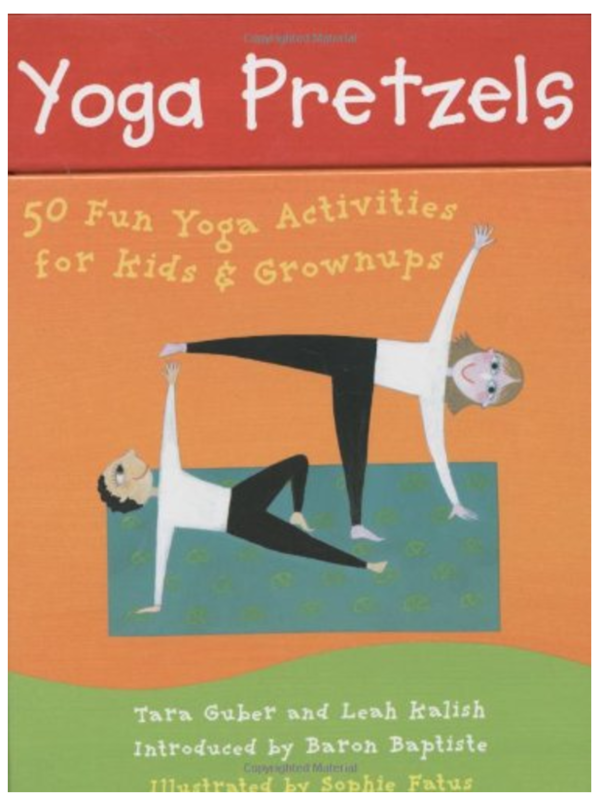 It incorporates many basic yoga positions, and it will be a lot of fun for the kids. Before moving on, I also wanted to mention that our beloved High Five magazine also often has a feature in the back that, while not yoga per-say, reminds me a lot of the kid yoga stuff I’ve seen in that it incorporates imaginary play with different poses and movement. S and C are big fans. Getting rid of excess energy when stuck inside is great, but I’m a big proponent of getting outside whenever possible. Bikes, trikes, scooters and other vehicles are huge lures for getting kids to head outdoors and these are some of our time-tested favorites. Hailed as “the quality choice in 3-wheel scooters for young children” this scooter for bigger little kids has more than it’s fair share of rave reviews and awards (the Oppenheimer Toy Portfolio Gold and Platinum Award Seals for Best Toy, the Parent’s Choice Approved Seal, ‘Best Pre-School Scooter’ by Toy Report, ‘Best Outdoor Toy’ by Learning Express Stores and was featured on the NBC Today Show as part of its ‘Best Toys for Summer’ series). The key is the “learn to steer” design and back brake, both of which grant preschoolers an extra element of stability. Also, the Mini can be ridden inside while learning (or waiting for Spring) as the quality wheels, made especially for Micro, are non-marking. I never got one of these but always wanted one (probably because I see them EVERYWHERE at the park and on the playground). The clever 4-in-1 design easily converts from a stroller to a steering trike, learning-to-ride-trike, and finally a classic trike. That means you have something fun for your little one to ride around in from the time they need to be pushed until they are ready to pedal all by themselves. The height adjustable handle and seat along with the removable canopy and tray allows for a lot of flexibility. I absolutely love this cozi coupe because it’s like 3 toys in 1, is this shopping cart/cozi coupe. Kids not only get to push their dolls around, but also fill up a shopping cart and get in and drive away. So many awesome play possibilities both indoors and out at such a great price! A quality pull wagon is a great way to get even the youngest kids outside enjoying nature. 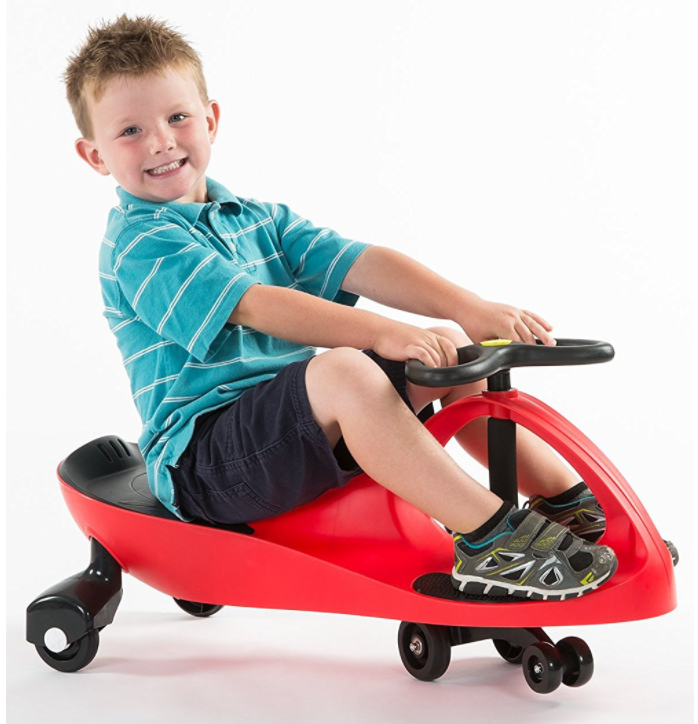 Bigger kids will enjoy riding along as well as pulling, so this is an item that you’ll get lots of use out of. I really like that this one comes with a canopy to be used on extra sunny days, as well as cup holders and padded 5-way flip and fold seats for a super comfy ride and lots of easy storage options for all your gear. Our daughter discovered this when we went camping with friends last summer. The innovative design (two wheels in the front instead of in the back) made it simple for her to master even at barely 2 years old. But don’t get me wrong – her 4-year-old big brother loved it too. This is a versatile ride-on toy that will get lots of use from kids not ready for bikes and accomplished cyclists alike. We did a giveaway with a large toy store last year and the owner wanted to give this away because he said it’s his best-selling toy ever. That right there says a lot. This is another fun non-bike option for getting some exercise outside. It’s also a great pick for bigger kids. Ok, I admit it, Power Wheels don’t encourage a whole lot of activity, and the price can be prohibitive. Honestly, we don’t have one for those two reasons. However, a good friend of ours does and so do our neighbors and it’s truly ridiculous how much my kids beg to play with it every single time either of them pull them out. They even seem to enjoy being the passenger as much as the driver. Also, I’ve noticed that these vehicles can lead to some pretty involved “lets act like grown ups and run errands, do yard work, etc.” dramatic play. So… if you have the budget to splurge this year and you want to see your kids’ eyes pop out of their head Christmas morning (or if you can justify the purchase because your child fights your every time you try to get them outside), this is definitely something to consider. Sports are excellent for establishing healthy habits and high self-esteem that will serve your kids for their entire life. While organized team sports can be great, at a young age I’m a big fan of keeping things low key and introducing sports and games in the backyard with the family. Here are some of our favorite picks for all playing together or for kids to practice on their own. Once again a friend of ours has this hoop and, again, I can attest first hand to what a draw it is to young kids (and the stellar Amazon reviews definitely back me up here). Her hoop is kept inside but I like that this can be used outside too. 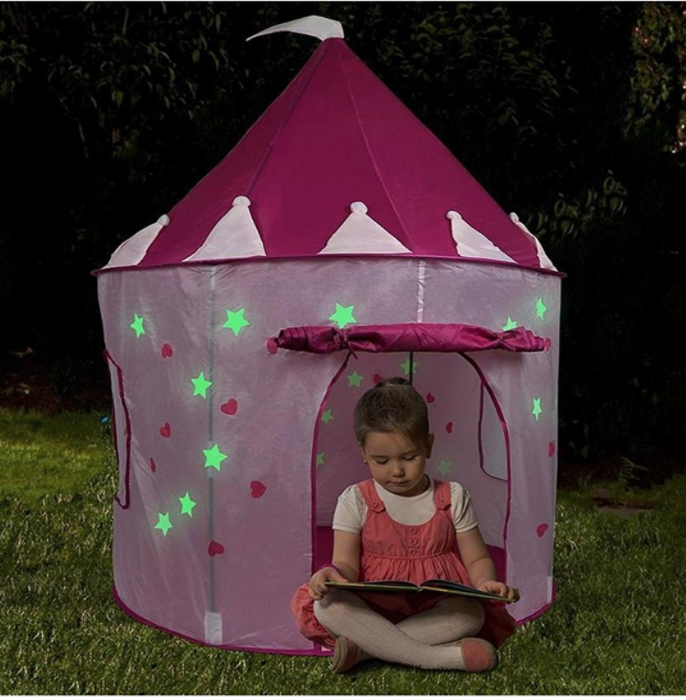 I also really like that it grows with your child (height can be adjusted to 6 settings from 2 to 4 feet) so this is a toy that you’ll get lots of years out of for a very reasonable price. Whether you want to go high-tech, or keep it simple, there are couple of great backyard T-ball sets available… Just like the Little Tikes Basketball Set, the Little Tikes TotSports T-Ball Set set gets stellar reviews as toy for introducing kids to T-ball and setting them up for success. The set includes an easy-to-use oversized bat, 2 oversize baseballs and an adjustable height “T” that adapts to a child’s developing skills. It also has a special “hang-on-the-wall” design for easy small-space storage and you really can’t beat the price… For a little bit more, you can get the decidedly more fancy, Fisher-Price Triple Hit Baseball set with three fun ways to play that progress with kids to help them learn to hit like a pro. Beginners hit from the tee. When they’re ready for a little more challenge, a simple adjustment converts this battery-powered trainer to pop-up pitch play for rookies: balls automatically pop-up from the base, one after another. And for pros, the trainer auto-pitches 3 balls from up to 10 feet away. Includes battery-powered trainer, bat and 3 balls and also gets lot of great reviews. Take any game of backyard T-ball or baseball up a notch with this set of durable and highly rated bases. I love how much easier these make it to have a real game on the lawn (and cut down on sibling squabbling over whether or not someone really touched the makeshift home plate!). An inexpensive must-have for the family that serious about pick-up games in the backyard. If you’ve got a soccer enthusiast at home, or just want an easy way to play with the kids in the backyard, these portable soccer goals are a great pick. They come in this 6 foot size as well as a smaller 4 foot set, both of which are well-made, durable, easy to set-up and break down and store away in the included tote. Our then 2 and 4 year olds got a set and a couple kid-sized soccer balls from their grandparents a few years ago after taking summer soccer classes and it’s been a great addition to our backyard. Nevertheless, this is still a super cool way to get kids outside and playing in a whole new way and a definite crowd-pleaser for playdates. It’s also a special toy because, like golf, it can be easily enjoyed when played solo or in groups – definitely a great buy. This versatile set gives you a lot of bang for your buck. It includes 1 soccer ball, 2 hockey sticks, 1 street hockey puck and 1 pitch back ball. That means young kids can use this to play soccer and hockey as well as to practice their pitching and catching with the pitch back feature of the net. If you have a little sports lover, this set will give him or her lots of ways to have fun outside for a wallet-friendly price. Note: Reviewers report that the soccer ball size is small and suitable for small children. And speaking of hockey, this indoor mini hockey set was recommended by one of our facebook fans and gets rave reviews as being perfect for all ages, from toddlers who are just starting out, to teens using it to play “knee hockey”. It easily folds up and comes with two goals, two soft foam balls, and six sticks including goalie sticks and both right-handed and left-handed player sticks. This will make your house the place to be if you have a room spacious enough for it. This is one of those toys that pre-teen boys (as well as younger boys and lots of girls) will just think is flat-out cool. Using unique Microprism Technology, anyone wearing the special glasses can see the ball light up a dark night sky at a range of over 100 feet. The football comes with two pairs of glasses but you may want to pick up a few extra sets for group play – you can buy different colors for different teams. 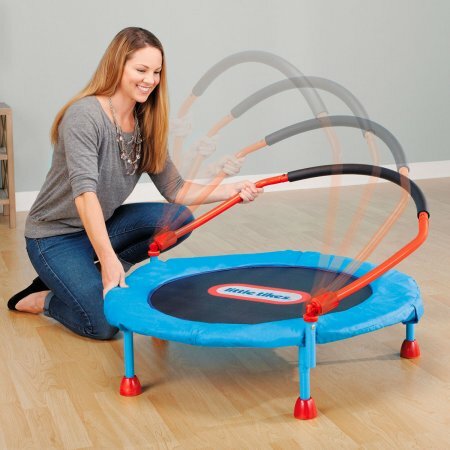 There is also a basketball and hoop, a hyper bounce ball, and a sports flyer disc available using the same technology. We gave these to the kids to help inaugurate our new backyard and they really took to them. I think they were surprised how far they could fling the disks and they’ve spent many hours throwing and chasing them down. I was presently surprised by the durability and amount of fun derived from such small, inexpensive toys. This was another facebook fan suggestion and I love that it uses one of my favorite childhood toys, the koosh ball. The light weight set can be used as a flying disc that catches and throws balls up to 150 feet in the air. It adapts to many sports such as volleyball, baseball, and tennis, plus it floats on water and can even be used with water balloons. This is one of those great open-ended toys that will not only get your kids moving, but will also spark their creativity as they come up with their own unique games to play with it. 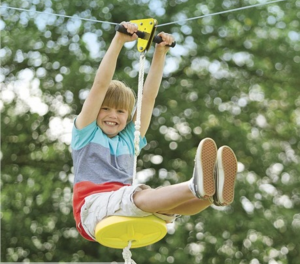 Last but not least, if you’ve got an extreme sports athlete in the making, and the space, check out this highly-rated backyard zipline kit. This set boosts an easy 30 minute set-up and smooth, consistent speed with gradual stop due to the “slack at the end of the line”. Reviewers consistently report lots of fun for the whole family. Of course, one of the very best parts about getting kids outside is giving them the opportunity to interact with, and learn about, the world around them. All of these picks will help get your child excited about nature and ready to become a little scientist in their own backyard. This toy is great for taking dramatic play outdoors and, honestly, it’s totally worth getting just for the adorable pictures you’ll get of the kids following around Dad (or Mom) while they mow the lawn. Seriously, this toy is a real winner – it has lots of parts to interact with (pull cord, vrooming engine, push throttle, turning key and more) but doesn’t require batteries. It will ignite the kids imagination and get them moving at the same time. A great read for any child interested in all those creatures living in their backyard. This book would be excellent bundled with any of the other outdoor exploration toys listed here. Both kids had one of these in their preschool/toddler group classes but both missed the butterflies coming out of their cocoons due to not having class that day so I’ve always wanted to have a kit at home for them to experience. Happily, S got a kit for her birthday so we’ll be trying it out soon. The stellar reviews this kit gets has me confident we’re going to have a great time with it and that it will get us spending even more time outdoors. We have owned this water table for years and still get so much use out of it! My 18-month-old son plays with it so much that we gated off a portion of our deck, that also has doors into our living room, so that he can freely walk in and out to play with all day long. To my surprise, even after years of pouring, dunking, sailing, etc. my 5 and 7-year-olds still find themselves drawn to the water table too. This is such an excellent toy for getting your kids playing outdoors and we use it all types of weather. It’s actually great fun to put on our rain gear and go play with it on the deck while it’s raining (plus there’s pretty minimal clean up for playing outside in the rain because they stay out of the mud). I highly, highly recommend this one and so do the multitude of positive reviews. Toys I recommend playing with while at the water table (aside from basic cups, bowls, and measuring cups), include these water bugs and net, this set of cups and a ball, and these squirting toys. My kids absolutely adore playing with “grown-up” flashlights right now, both indoors and out. The problem is they keep leaving them on and draining the batteries. So we’re putting these in their stocking this year. I just know they’re going to think the hand crank power system is super cool. IKEA only sells them in stores but you can use the link above to get them online through Amazon. Even some indoor toys can be great for getting the kids interested in exploring outside. This nifty set of fossil skeletons can be used for making play dough impressions during art time and then brought outside to play excavation site in the sandbox. This scope’s large, easy-to-handle design is perfect for little hands. Kids can trap whatever they want under it, then use the light and knob for 6x magnification. And who better than the cat in the hat to come along with us on our Butterfly exploration? This is the perfect beginning science kit for any bug lovers in your family. A lot of parents also report kits like these helping their little ones to overcome their bug phobias. Props like these are an excellent way to turn playing in the backyard into a full-blow exploration. I could see both of our kids having a blast excavating around the sandbox with the field tools, especially if he had the snazzy vest to hook them to.